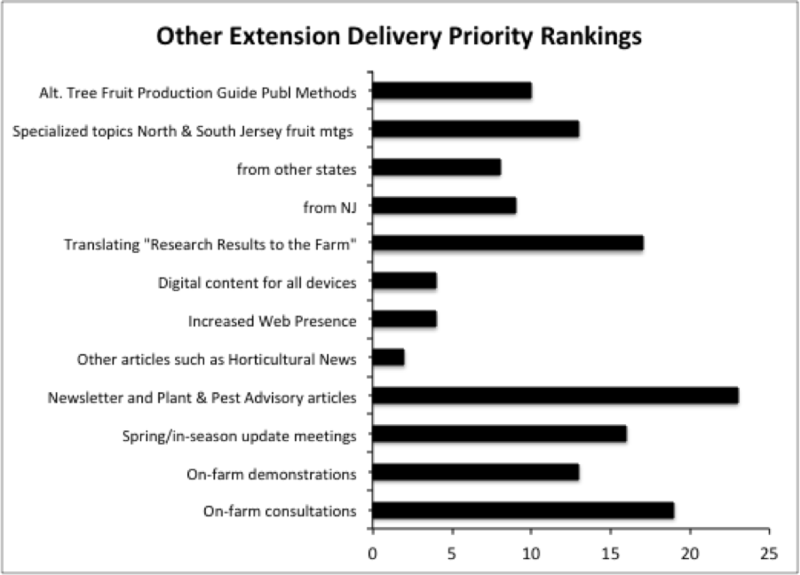 During the fall and winter months of 2016-17 the NJAES Tree Fruit Working Group put together a grower survey with the objective of NJ tree fruit growers ranking various tree fruit research and extension activities done by Rutgers/NJAES. The survey consisted of separate discipline or program areas with rankings for each area. A first draft survey was vetted using input from a small grower advisory group in southern counties, and again at the Hershey meetings by the NJ State Horticultural Society board of directors. Comments from the 2 advisory meetings were incorporated into the survey prior to it being given out at the South Jersey Fruit Meeting (February 16, 2017) and the North jersey Fruit Meeting (March 1, 2017). A total of 34 responses were collected, representing 12 counties, plus 1 out of state grower. NJ responses represented 2,480 acres of tree fruit production. The survey combined stone fruit and pome fruit activities under most discipline areas; so tabulated results are combined under both crop types. 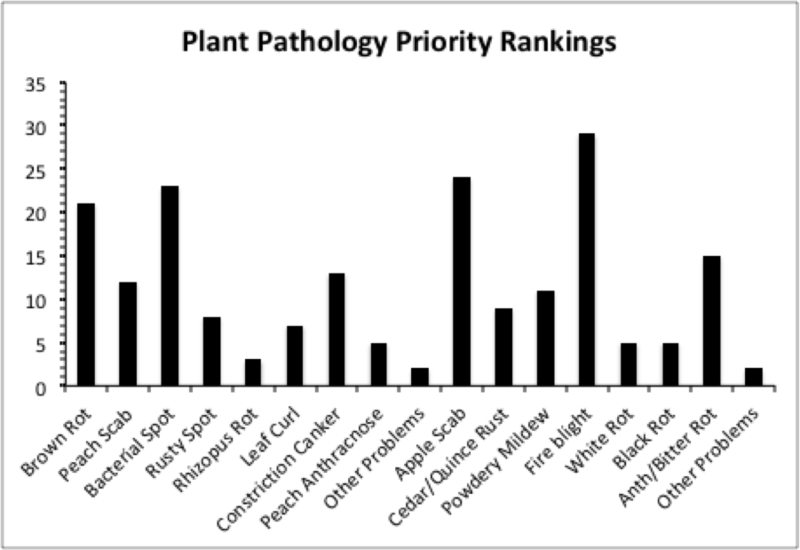 Under pathology rankings, brown rot and bacterial spot research were considered the highest stone fruit priorities, and apple scab and fire blight were considered the highest pome fruit priority areas. 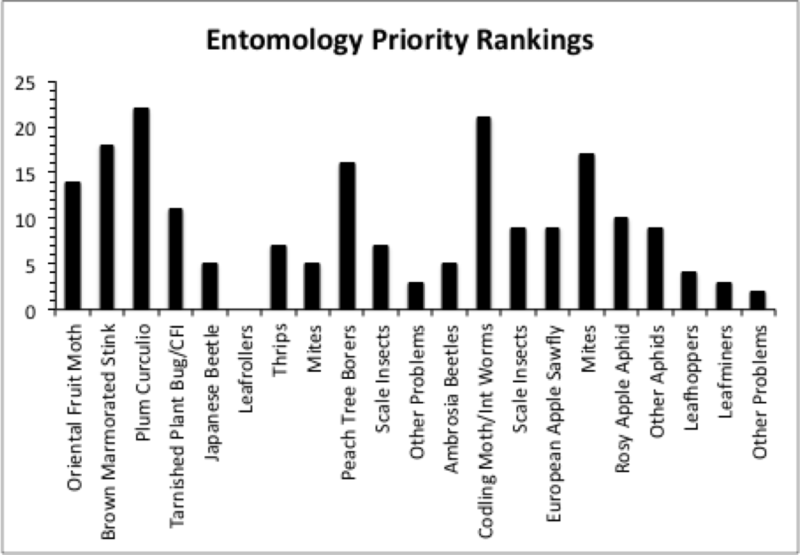 Growers ranked plum curculio as the most serious peach insect pest needing research work, and codling moth and other internal worms requiring the most attention in apples. Pesticide resistance management was ranked as the most important general pest management research area. 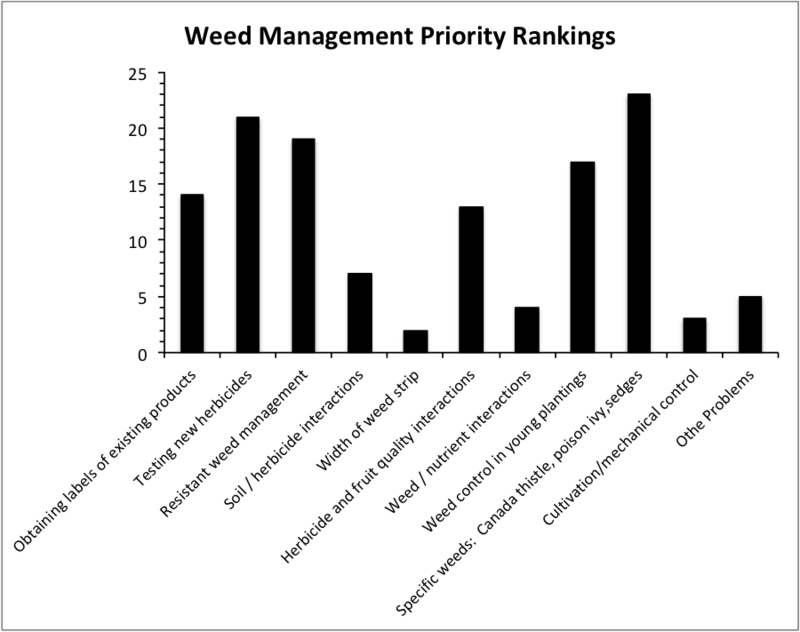 Growers ranked obtaining labels for new herbicides, and work on problem specific weeds as the 2 most important areas for weed science. 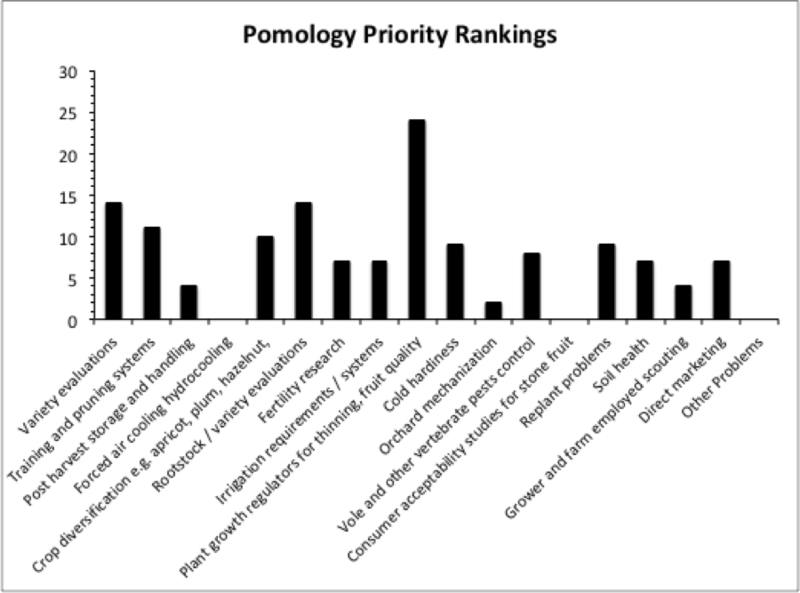 Growers ranked work in plant growth regulators for thinning and fruit quality, and variety evaluations as the 2 most important areas needing work in pomology. 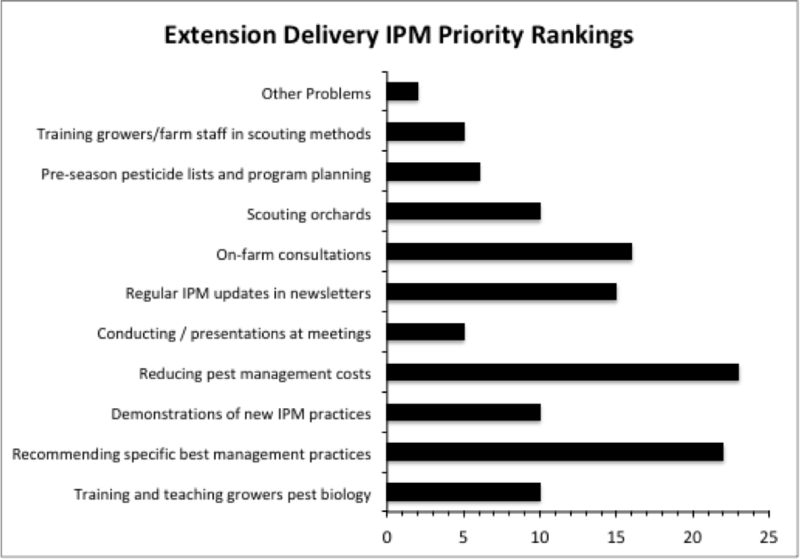 Grower’s greatest needs in IPM delivery were for reducing pest management costs, while recommending best management practices for specific pests. Rankings of extension priorities showed an industry need for newsletters and “Plant and Pest Advisory” articles, on-farm consultations, and translating research results for on-farm use. 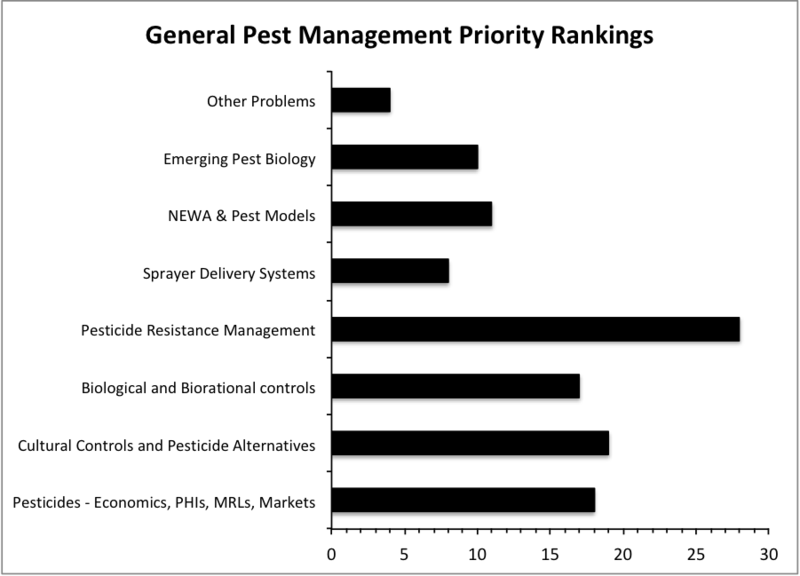 General pest management priority rankings. General tree fruit extension priorities.